Lhakar is a Tibetan resistance movement that started in Tibet, where people are making a conscious decision to define who they are as Tibetan. That in turn manifests into an unlimited number of actions that people initiate and take part in. Writing is one of most powerful ways to let others know your thoughts and writing in Tibetan is a double edge swords in resisting suppression and promoting Tibetan language. Tibetans have been using digital tools to express their thoughts in writing. Here is one from inside Tibet posted on Weibo (Chinese Twitter) on a Wednesday few weeks ago. Tibetan script, Tibetan Language and Tibetan people are Tibet’s blood. Tibetan home, Tibetan friends, and Tibet’s soil are Tibet’s land. Tibetan food, Tibetan Tsampa, and Tibetan Chupa are Tibet’s Flavor. Love for Tibet, passion for Tibet and thinking about Tibet are all for Tibet. This Wednesday we crosspost another High Peaks Pure Earth blogpost about one of the most popular song from Tibet in recent times. 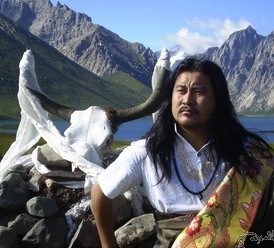 Dolma Kyap is a very popular and well-respected singer from Amdo, known for his strong voice and integrity. He has become so renowned for this song that he is popularly known as “Gangchenpa Dolma Kyap”. Dolma Kyab’s powerful rendition of his song ‘Gangchenpa’, Tibetans of the Snowland, on an open stage with back drop of vast Tibetan grassland captivated audiences as well as Tibetans viewers across the world. 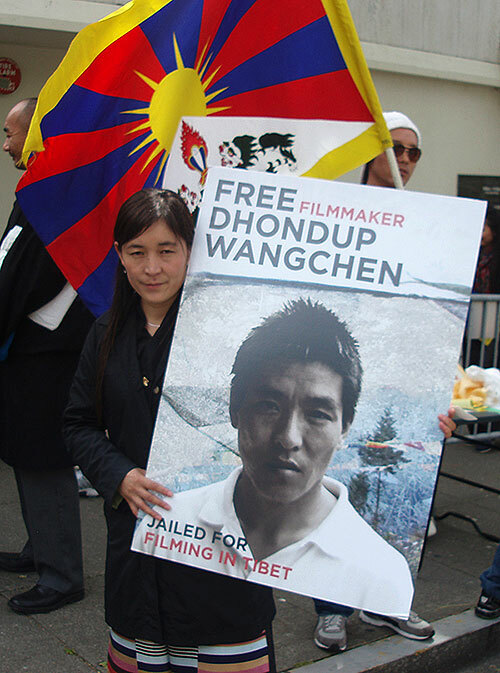 Lhamo Tso, activist wife of jailed filmmaker Dhondup Wangchen, granted political asylum in the U.S.
(March 18, 2013) On February 27, Lhamo Tso was granted political asylum by the United States of American in San Francisco. The idea to seek asylum in US came up last July when the Bay Area Friends of Tibet (BAFoT) along with other groups invited Lhamo Tso to the United States and organized the West Coast leg of the US lecture tour. The purpose of her visit was to advocate for the release of her husband, Dhondup Wangchen, who is serving a six year prison sentence in China. After returning back to India Lhamo Tso travelled again to California and with the help of BAFoT obtained political asylum. Her main concern now is to reunite her family and to continue with her efforts for the release of her husband. Lhamo Tso is very pleased and gives thanks on behalf of her family the US government for showing so much concern for her request. She would like to express her gratitude for all the help her family was given by various individuals and groups such as Mr. Tenpa Tsering in Delhi, Testen and Nyima Thondup in Switzerland, her friends in Dharamsala, the Tibetan Women’s Association in India, the officials of the Tibetan Children’s Village, the Dhomed Association, Gu- Chu-Sum, Tibetan Youth in Europe, US and India, International Tibet Network, Students for a Free Tibet, Save Tibet Austria, International Campaign for Tibet, Amnesty International, Committee to Protect Journalist, the various Tibetan Communities, her pro bono attorney, Kathleen McKinley, Tenzin N. Tethong and Yangchen Surkhang Lakar, Tibet support groups around the world, and anyone who helped her along the way. Her special thanks go to Filming for Tibet, toBAFoT, and the Vassallo family who have given her moral support and generous hospitality for many months. As Lhamo Tso continues to campaign for Dhondup’s release and resettle herself and four children to the United States, BAFoT will coordinate all courtesies that may be extended to Lhamo to offset the costs of her family’s US resettlement. Tashi Rabten (pen name: Theurang) is a Tibetan writer, poet and editor who is serving a four-year sentence in Mianyang Prison, Sichuan Province. He graduated from North-West University for Nationalities and edited the now-banned Tibetan language journal “Shar Dungri” and also published “Written in Blood”, a compilation of his poems, notes and writings on the situation in Tibet following the 2008 protests. 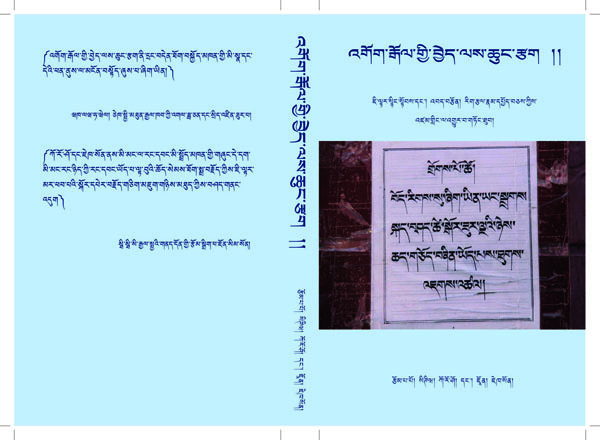 On the fifth anniversary of 14 March 2008 protest in Lhasa, TCHRD has translated and edited one of Theurang’s essays written before his arrest and subsequent imprisonment in 2009. The essay was republished in exile in the book “Reflections on 2008 Protests: a Collection of Essays by Tibetan Intellectuals in Tibet”, by Domey Editorial Committee, Dharamsala, India. Freedom and democracy are fundamental aspirations of human beings. Every human being and nation on this earth is heading towards democracy, equality and freedom, leaving behind oppression and exploitation of dictatorship and slavery. For the values of democracy and equality, many great men and women gave up their lives. On this earth beneath the vast sky, although freedom and democracy belong to the entire humanity, they will never belong to those who oppress by practicing dictatorship. Be it individuals, organisations, governments or nations, it is a universal truth that those who oppress by practicing dictatorship, their hands and legs will be crushed under the rolling boulder called freedom, equality and democracy. For many years, we have been fighting for our rights—for the values of equality, freedom and democracy. We have been raising slogans and banners for them. Fighting for universal values of human rights is an act of seeking truth. We are not afraid of any one. No one can stop us. Since 2008, Tibetans inside and outside Tibet have pursued many campaigns such as protests, fasts, peaceful marches and other commemorative events. These non-violent campaigns reflect the agonising thirst of the Tibetan people for freedom and democracy. They expose the political system and policies of the People’s Republic of China under which we are living. Our campaigns are not to secure freedom and democracy for Tibetan people only. They reflect the growing aspirations and hopes of peoples and nations who yearn for freedom and democracy. Many nations and peoples on this earth support our struggle. Any nation or people aspiring for democracy must respect the life of every individual citizen without any discrimination. Amid our non-violent struggle, however, we witnessed ‘some ugly incidents of looting, burning, smashing and killing.’ Such incidents violate human rights and sacredness of human lives and thus pollute, and are a blot on, the non-violent struggle of our people. Moreover, these horrible incidents tarnish our movement in the eyes of other peoples and nations, contradict the vision of peace espoused by the noble Gyalwa Rinpoche and negate a people fighting for truth and justice. Since we do not have military might, we cannot pursue an armed struggle. The only solution we have is non-violent protests that express our opposition to lies and oppression of Chinese government. It is extremely important that such non-violent protests are organised in countries and among nationalities that cherish democracy and freedom. While campaigning for freedom, many of our brave fellow Tibetans lost their lives to guns while many underwent enormous suffering walking thousands of miles on peaceful marches. If you are a Tibetan nurtured on milk and tsampa, if Tibetan blood is running into your veins, you have to speak up and campaign for Tibetan freedom. You cannot support dictatorship and slavery. I have heard that some Tibetan leaders [working for Chinese government] are criticising our freedom struggle. In Chinese newspapers and televisions, some Tibetans are condemning it. The Tibetan nation cannot be represented simply by Tibetans living under Chinese rule, leave alone by a few Tibetan residents of Lhasa. Moreover, those reactionaries who have become tools of Chinese oppression cannot represent the Tibetan people. This truth should be made clear to the world. In our campaign for freedom, many Tibetans have lost their lives. Rather than accepting this truth, China is attempting to hijack our non-violent struggle. We must send true information and pictures of our protests to the outside world. We must mention the number of Tibetans killed and arrested, slogans raised by protestors and places where protests were held. “A true and verified picture of an injured Tibetan is more valuable than [poorly-verified and thus hard to prove] information about the death of a hundred Tibetans,” a friend once told me. This is true. No matter what campaign we pursue, we must not pursue them in haste—that is without any strategic planning. Nor should we resort to violence. Moreover, our educated folks must write appeal letters on behalf of Tibetans who were arrested and disappeared in some places. All these information must be propagated throughout the world. In short, freedom and democracy belong to those who fight for them. They will never belong to those who murder democracy and freedom by practicing dictatorship and slavery. If we do not lose our pride and determination, Tibetan people will have a chance to taste democracy and freedom one day. A simple yet powerful song that prays for the long live of His Holiness the Dalai Lama from Tibet. This became a beloved song for its lyric as well as for its music both inside and outside. and lifts us from this karmic cycle. Tibetan Buddhism stresses the importance of the teacher as the source of knowledge and the one who guides beings through the evils of the world. This is one reason why Tibetans have such deep faith in reincarnate beings, especially those whose previous incarnations have left a legacy of teachings. For Tibetans, the Panchen Lama is a highly revered reincarnate being and a religious teacher. The first Panchen Lama and the first Dalai Lama were disciples of Tsong Khapa, the famous founder of the Gelugpa sect of Tibetan Buddhism. From the very first Panchen Lama, this line of reincarnate beings attracted religious followers in Tibet and made important connections that led to the lineage becoming one of most well known and beloved religious leaders in Tibet. The fourth Panchen Lama, considered to be the greatest teacher of the time, played a pivotal role in the search and recognition of the great fifth Dalai Lama, who consolidated temporal and spiritual power of Tibet. Since that time on, these two reincarnate lamas developed a religious connection, which included playing an important role in finding each others’ reincarnation when possible. The 10th Panchen Lama shared a special bond with the current Dalai Lama even though the two were separated by political circumstances. The Dalai Lama jokingly refer to the 10th Panchen Lama as the ‘brave one’ because he stayed behind in Tibet and suffered greatly during the Cultural Revolution in the 1960s and 1970s. 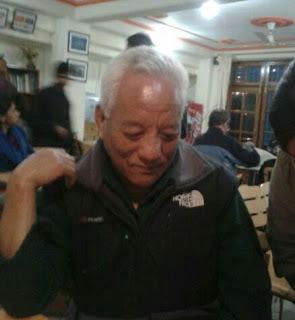 After his political position was reinstated in the 1980s, he fought hard to preserve Tibetan identity, including re-instituting Tibetan as the primary language in Tibetan schools. Some years after the 10th Panchen Lama passed away in 1989, His Holiness the Dalai Lama recognized Gedhun Choekyi Nyima, who was six at the time, as the 11th Panchen Lama. A few days later, on 17 May 1995, Chinese officials took him into custody and for the last 17 years, his whereabouts and well being have remained unknown despite repeated urging from Tibetans and world governments. China installed another boy, Gyancain Norbu, as its choice of Panchen Lama. Tibetans have dedicated many prayers and songs to successive Panchen Lamas and many of them are collected here. One of the most famous songs dedicated to the 10th Panchen Lama was composed in exile before he passed away. It is a song about the bond between the Dalai Lama and the Panchen Lama. It is a sad reminder of the political reality but at the same time a Tibetan belief that there will be brighter days ahead. It became an instant classic both inside and outside Tibet. Below is the Tibetan translation of the song. It is karma of sentient being. the Sun and the Moon will one day reappear. there will be result, one day. There were so many stages in my life when Losar meant different things to me. Losar when growing up reminds me of fun and excitement. All I cared about were the new clothes, brand new shoes, money under my pillow that I always believed the Losar Fairy (my parents made sure to put the money in an envelope) had placed and of course, the fire crackers on the 29th day of the last month before Losar. The altar looked beautiful with all the Derka and offerings, but those were amongst the least of my interest although asking Konchok (god) for permission to steal some chocolates and candies, nuts and dried cheese from the altar is another thing. Losar then began to challenge me as a grown up. I started feeling embarrassed wearing new clothes and wasn’t too excited about getting extra pocket money. Losar was about going to school and giving exams. 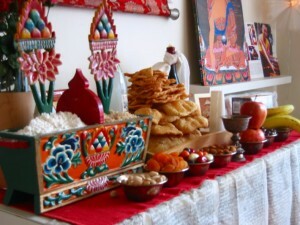 Losar was about taking more responsibilities, it was about learning how to arrange the altar and the offerings, preparation for Guthuk, sweet rice and my favourite – butter tea. 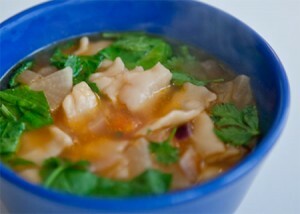 Eating Guthuk is an important Tibetan tradition that signifies the safe passage into the New Year. There after, Losar became a tool. A tool to get peoples’ attention to our cause. A tool for Tibetans inside to defy the Chinese authority. A tool for Tibetans living around the world to be ourselves and celebrate our existence. Losar could be like any other new year, but to me, although the meaning of Losar varied each time, these different stages helped me grow into my identity. 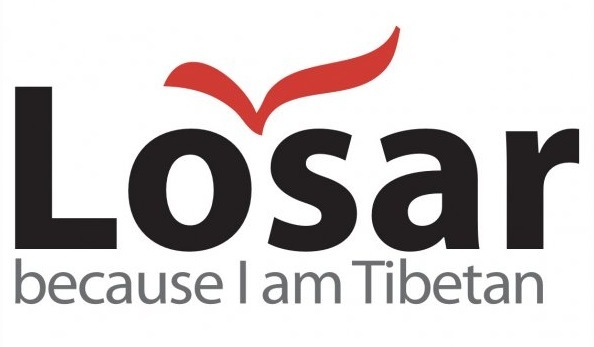 The Chinese authority may try and manipulate our Losar, but they can’t take away the Spirit of Losar – the spirit of being Tibetan.